REAPER-class Mjolnir is a variant of the MJOLNIR [GEN2] armor. Design features sourced from the remnants of Forerunner combat skins have been directly incorporated into REAPER-class armor, but their compatibility with human operators has yet to be fully assessed. This means the maximum potential of the REAPER will only be unlocked after substantial improvements are made to the base Mjolnir techsuit. Helmet Description: The maximum potential of the REAPER will only be unlocked after substantial improvements are made to the base Mjolnir techsuit. Body Description: Design features sourced from the remnants of Forerunner combat skins have been directly incorporated into REAPER-class armor, but their compatibility with human operators has yet to be fully assessed. Render of the REAPER-class armor in Halo 5: Guardians. Three-dimensional renders of the Reaper armor in Halo 5: Guardians. Three-dimensional renders of the Grim skin in Halo 5: Guardians. 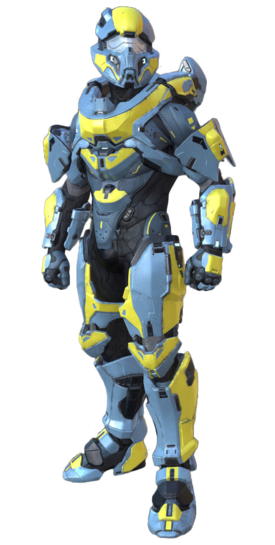 A Spartan-IV wearing the REAPER-class armor.